Do you remember how much you hated taking pop quizzes in high school? Well, following Tuesday’s UFC 146 press conference in Las Vegas, which featured six of the card’s biggest superstars, the Nevada State Athletic Commission surprised the fighters by requiring them to submit to drug tests. Champion Junior dos Santos, Alistair Overeem (Pictured), Frank Mir, Cain Velasquez, Antonio “Bigfoot” Silva and Roy Nelson were all asked to surrender urine samples following today’s presser. Of the six heavyweights, only Silva has flunked a drug exam in the past. After beating Justin Eilers to capture the Elite XC crown in July of 2008, Silva registered positive for the anabolic steroid Boldenone and was issued a one-year suspension by the California State Athletic Commission. However, Overeem’s presence in Las Vegas is what likely prompted today’s impromptu screening. “The Demolition Man” had some issues with his pre-fight test for UFC 141. After clearing the air with the NSAC, the board granted him a conditional license to fight Brock Lesnar on New Year’s Eve weekend. 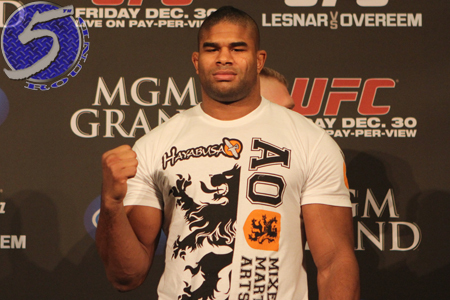 As part of the commission’s stipulation, Overeem would subject himself to two random exams over the next six months. Tuesday’s urinalysis now leaves him with only one test remaining on that commitment. According to the report, the results may not become public until after UFC 146. Unless, of course, any of the results return positive and the NSAC would be forced to take action against the guilty party. UFC 146 goes down May 26th inside MGM Grand Garden Arena in Las Vegas.